Andre Saldivar (left), who oversees SCE's Foodservice Technology Center, talks about the latest in energy-efficient kitchen equipment with business owner Steve Henderson. Andre Saldivar (right), who oversees SCE's Foodservice Technology Center, talks about the latest in energy-efficient kitchen equipment with business owner Steve Henderson. Richard Young, director of education for Frontier Energy, speaks at SCE’s food forecast seminar. Customers take part in the “Foodservice Forecast: Efficiency, Sustainability, Growth and Trends” workshop at SCE’s Energy Education Center. With help from SCE, a new franchise owner of Burgerim is making sustainability part of his business plan. 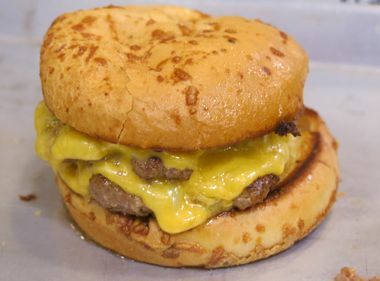 As the burger and pizza food trend continues strongly, Steve Henderson is about to jump in with his very own gourmet burger sliders restaurant in Carson. As a new franchise owner for Burgerim, Henderson has signed a lease and is getting ready for a September opening. He’s determined to make his new venture a financial success and savings from the use of energy-efficient equipment is part of his business strategy. We help customers make their kitchens as efficient as possible in the back of the house so they can make more money in the front of the house. Henderson’s was one of several businesses that recently attended the “Foodservice Forecast: Efficiency, Sustainability, Growth and Trends” workshop at Southern California Edison’s Energy Education Center. Not only did they learn about the latest food industry trends, they also learned about the latest in energy-efficient industrial equipment, LED lighting and how to design an energy-efficient kitchen layout. The workshops are part of an ongoing series of seminars that help business owners make smart decisions when it comes to energy-efficient equipment and savings. “We help customers make their kitchens as efficient as possible in the back of the house so they can make more money in the front of the house,” said Andre Saldivar, a mechanical engineer who oversees SCE’s Foodservice Technology Center at the company's Energy Education Center. Last year, 79 percent of restaurants in a National Restaurant Association sustainability survey said they use LED or CFL lights. But when it came to Energy Star appliances — what SCE and other utilities recommend when buying energy-efficient equipment — only 46 percent of restaurants bought these types of refrigerators. The numbers were even more dismal for Energy Star dishwashers at 25 percent. And when it came to programmable thermostats, only 61 percent of restaurants surveyed said they had installed these newer, more energy-efficient thermostats. “We have a lot more work to do,” said Richard Young, director of education for Frontier Energy, who was one of the speakers at SCE’s food forecast seminar. “Restaurants are like very energy-intensive factories. You need sustainability because you want to stay in business. And Henderson has already done just that. He has met with Saldivar to discuss different types of equipment he’ll need to purchase and the best layout for his kitchen. His new location will seat about 60, both indoor and outdoor. 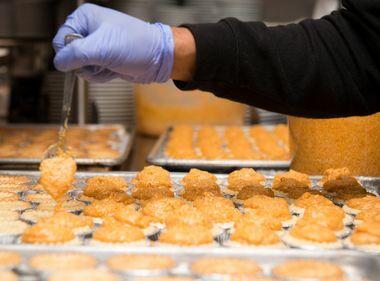 Some of the energy-efficient equipment Henderson is looking at includes: convection ovens, charbroilers, griddles, reach-in refrigerators (as opposed to walk-in refrigerators that use much more energy) and low-flow nozzles to save water. “I like the idea of fresh food, not frozen food,” said Henderson. 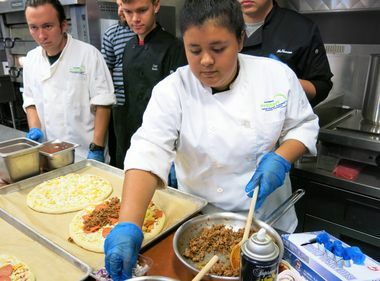 “Burgers and pizzas have been the hottest trends in the last few years because they give you options, you can customize your choices,” said Saldivar. Henderson plans to bring back what he has learned to the owners of Burgerim since the other franchise owners can benefit from the new trends in sustainability. And like Henderson, an increasing number of SCE’s business customers are now partnering with the utility on their clean energy choices. “They are listening a lot more,” said Saldivar. For more information: Foodservice Technology Center.